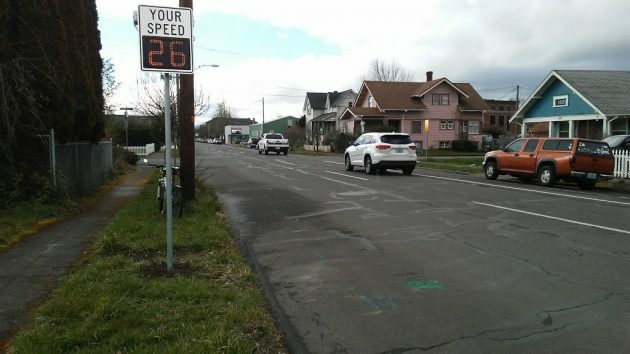 The speed display sign was moved to this spot on First Avenue last week. The speed limit on both legs of the one-way couplet east of central Albany is 25 mph. There had been complaints about speeding on Second, prompting the police department to test whether a permanently mounted radar unit would cause a change. Irish told me the sign was moved to First last week at the request of the Albany police because the department wants to test its effectiveness at a second location. The display should stay up for at least at couple of months in order for speed studies to show enough data. I live on 1st and regularly pass by both of those signs. They definitely help me keep my speed under 25. Any idea how much these signs cost and how much it costs to maintain them? I think it helps to have the speed limit posted at the radar sign, at least it does with me. I would love to have that sign on the Water Ave raceway so many speed on to avoid traffic lights. At least (2) intersections are very dangerous and for those of us that live close to the road cars whizzing by are rather irritating. Yes, I’m biased because I live on Water. In some ways reminiscent of perhaps the most significant Peter Principle wherein the amount of work expands to fill the time allotted. Put a couple speed ‘humps’. That will slow them down. It does in my neighborhood…. Thank you Ronald Huss for your comment about Water Street. We too live on Water Street and have complained to the police department about the traffic down here to no avail. The problem is that the speed is not set by the signs, but the conditions of the road. If the road is wide and straight, cars will go faster regardless of the signs. You could put a 10 MPH sign and people would still go 40-50 if the road is wide as Pacific Blvd.